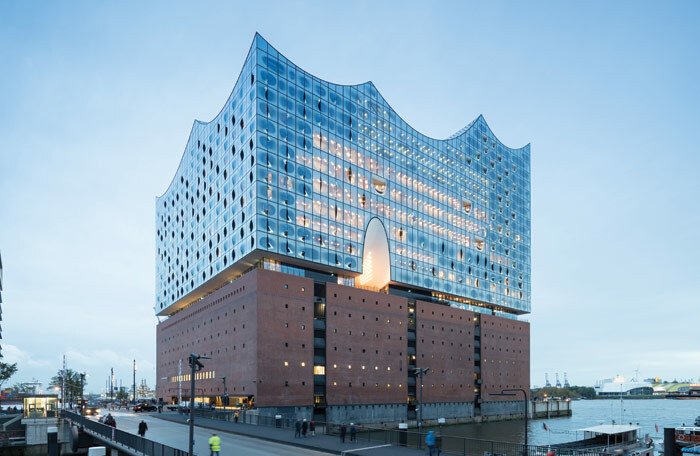 The peaks and troughs of the roof of Herzog & de Meuron’s new Elbphilharmonie in Hamburg could be a metaphor for its history of popular support, political opposition and rising costs. 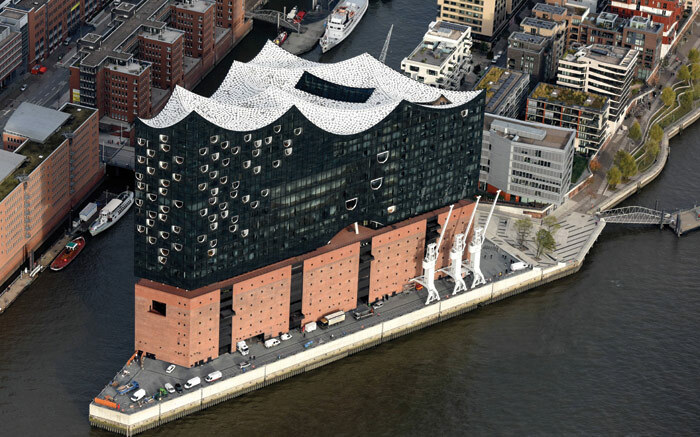 The crystal fantasy landmark does however put Hamburg on the architectural map. Words by Herbert Wright. Waterside warehouses rendered redundant by containerisation in the Sixties and Seventies are nowadays assets for docklands regeneration across Europe. They may get repurposed into flats, offices or even museums, but they still look like warehouses. Not so in the case of Hamburg’s Kaispeicher A, a vast, 37m-high brick storehouse for coffee and cocoa. It has been extruded upwards in glass to a roof of waves as bold and expressive as a child’s picture of the sea. Sandwiched between brick and glass volumes is a high, town square-sized platform, open to all. 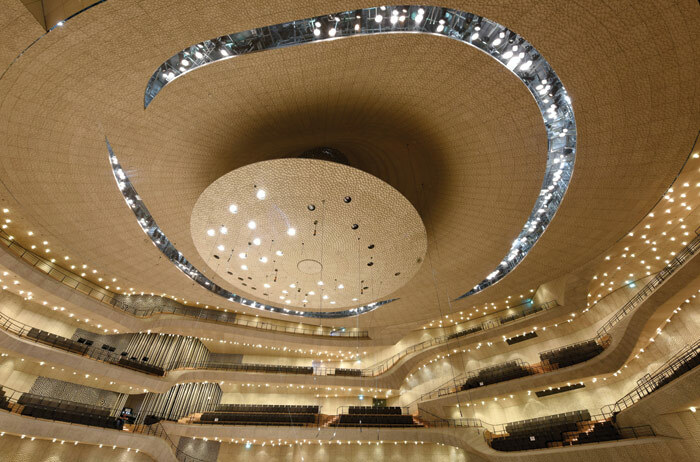 Above it are two concerts halls within the new glass volume, the larger one of the biggest in Germany. All this is reached, as we shall see, through a dream-like passage inside Kaispeicher A’s walls, still standing like a palimpsest of the past. 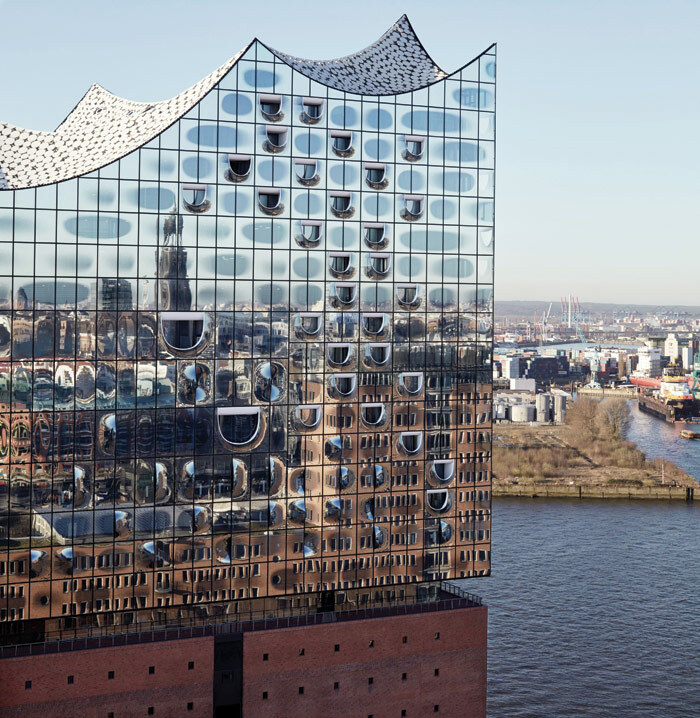 This whole hybrid ensemble is the Elbphilharmonie, a project designed by Herzog & de Meuron. 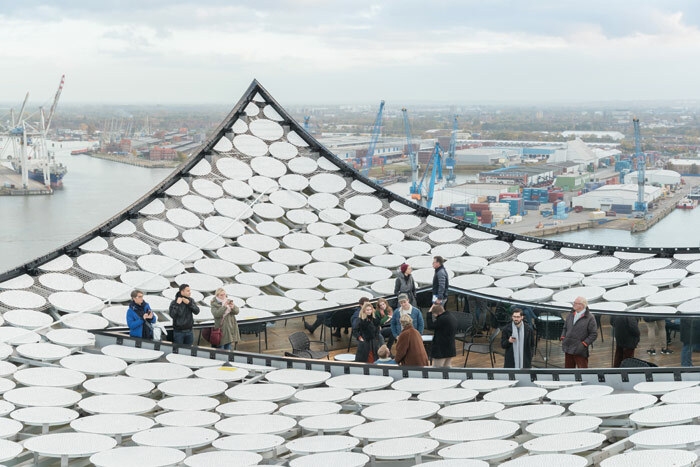 It transforms Hamburg’s skyline, its cultural offering, and more. But the Elbphilharmonie has not all been smooth sailing. In fraught meetings with Hamburg authorities lasting up to seven hours, it was almost drowned. Jacques Herzog recalls that his practice co-founder, Pierre de Meuron, ‘saved the project several times… We were really scared, there were moments when we thought they could destroy the project’. 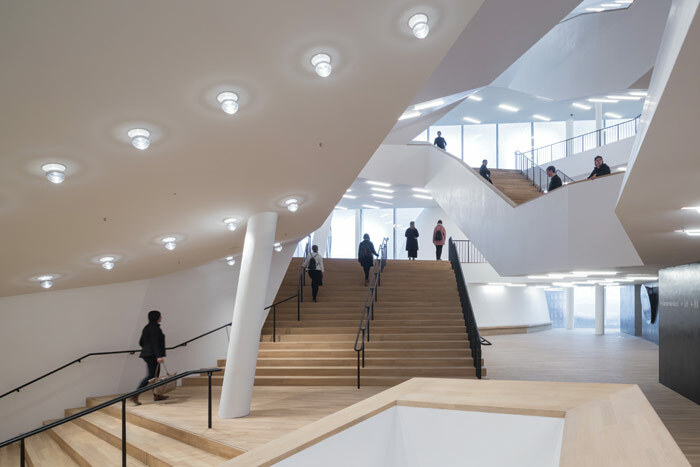 The project’s construction costs increased tenfold from initial estimates, eventually costing Hamburg €789m on structural completion last October, or €865m including investor contributions. For all its efficiency, Germany too can struggle with mega-projects. The cost of Berlin’s new Brandenburg Airport blew up from €2.5bn to €6.6bn, and if it opens next October, it will be six years late. The long-running Stuttgart 21 railway project is even more expensive and has stirred massive street protest. By contrast, the Elbphilharmonie is finished, dazzling, and ready for the music. The story begins with the warehouse. Hamburg’s old docklands area, Speicherstadt (Warehouse Town), lies between the city centre and the river Elbe. Fingers of land between canals are piled with century-old, tall, neogothic red brick warehouses, sometimes reminiscent of Manchester. 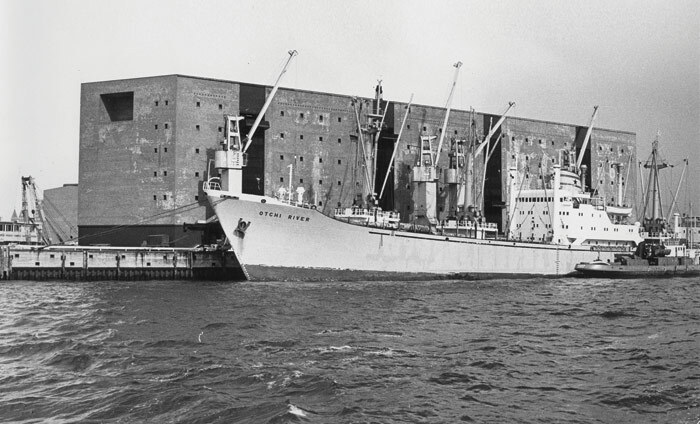 Bombing in the Second World War destroyed a large warehouse on a quay jutting out into the Elbe, and its replacement was by local modernist architect Werner Kallmorgen, who had designed the nearby Freihafenampt (1956) office block, respecting the materiality of the warehouses around it. Kaispeicher A, finished in 1963, was also brick, but looked brutally different. It was a vast box, needing 1,111 piles to support it. 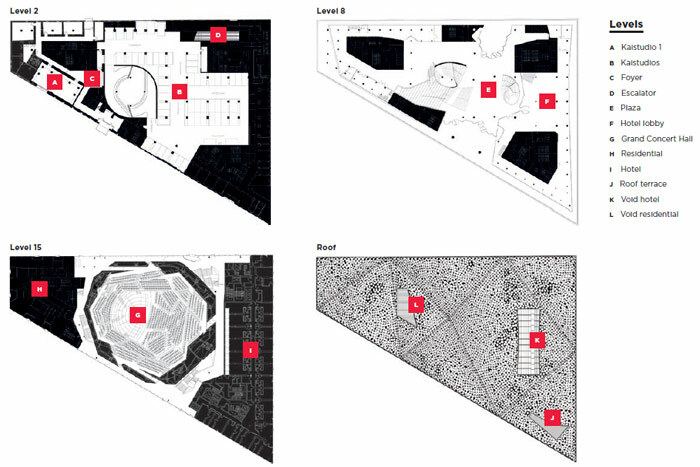 Its plain facades, minimally punctuated with a matrix of small windows, were cut by full-height, vertical loading bays on the north and south sides and a high, rectangular aperture on the west. Trapezoid in plan, its longest side stretched 126m along the Elbe on its south, but it was just 22m wide at the quay’s sharp western end. It closed as port activity migrated to the other side of the Elbe, silent along with three cranes on its southern quayside. By 2001, Speicherstadt’s revival was underway. A MediaCityPort complex on the site, with a kinked tower (not dissimilar to Hadi Teherani’s Tango Towers built a decade later in Hamburg’s St Pauli), was designed by Dutch architecture practice Benthem Crouwel. However, an architect-developer called Alexander Gérard suggested instead a concert hall to Herzog & de Meuron, one not hidden away inside the warehouse. Herzog recalls that ‘we made a sketch. It had this tent-like form’. It caught the public imagination — Herzog reports that ‘the rendering was so seductive, it was a real people’s movement to do this’. The architects were appointed in 2003. 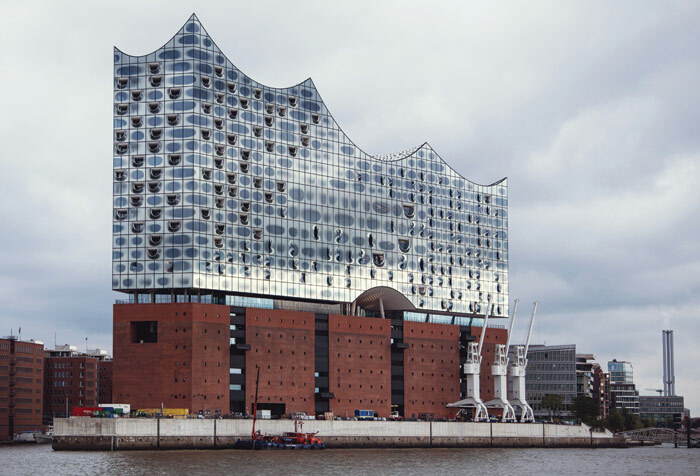 Hamburg dropped the Dutch design and took over the concert hall project, called the Elbphilharmonie. In 2007 (when construction costs were still projected to be €114m) work began on gutting the old warehouse, followed by driving another 650 piles to support what would be a 200,000-tonne structure. It was topped out in 2010, roofed in 2014, and the official opening is January 2017. Since November 2016, the public have had access into the structure. At its east end, the old Kaispeicher facade is cut into at ground level. The recess accommodates an entrance to the 14-storey, 244-room Westin Hotel directly above it in the new glass volume, and the drive-in for the car park, which takes up most of the old warehouse volume over six floors, plus a basement. 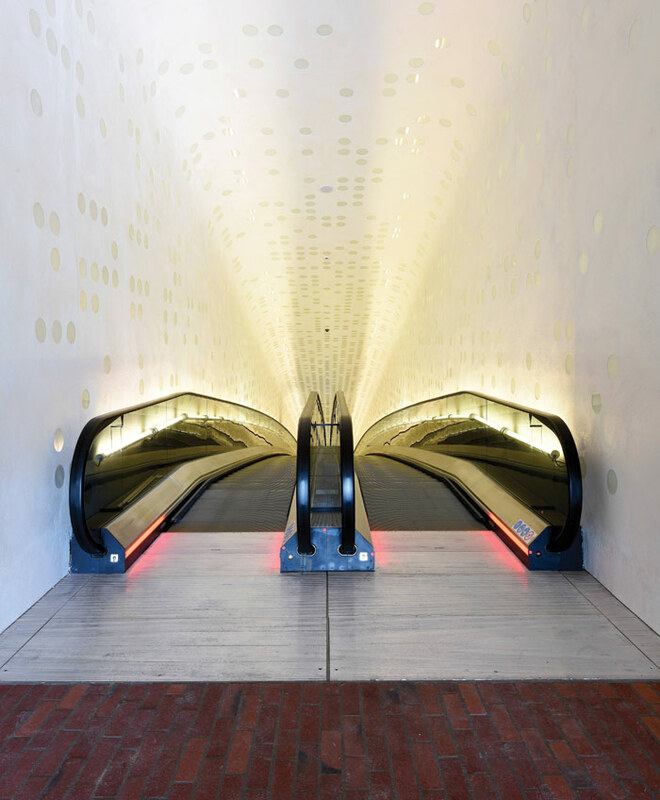 Those who enter by foot pass through ticket barriers — it’s free but controlled and pre-booking costs €2) — and the adventure inside the building begins. An escalator leads up through an illuminated tunnel called the Tube. It curves like a straight path to a gentle hilltop, so the far end is invisible. Just stepping towards it conjures extraordinary connotations — the warm, creamy light suggests a passage to heaven, but at the same time, entering this soft, organic passage is almost sexual. Inside, 8,000 reflecting circles or ‘sequins’ on the white walls are like a Yayoi Kusama installation, but without colour. Herzog admits that ‘we were thinking of (a complete covering of ) mirrors, but that would be too much!’ The escalator is 82m long (making it the second longest in the EU, after the Metro station at Námestí Míru, Prague), and cuts through the Kaispeicher almost end-to-end. It lands below its western, open aperture, which has a large recessed window. 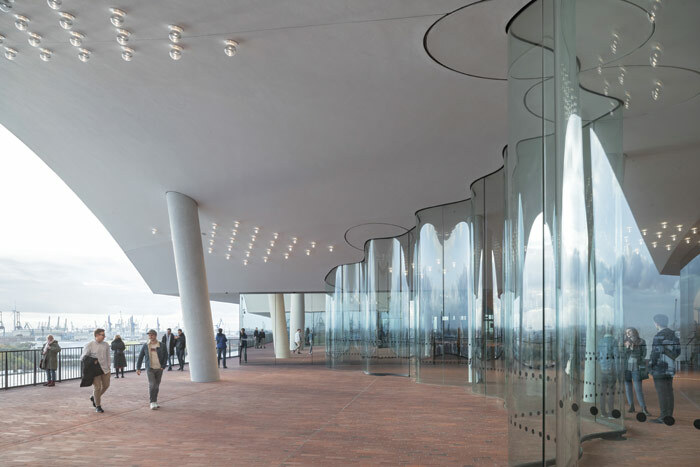 De Meuron comments that, ‘we had to make a stop at this found opening. If you are in an existing building, you use what is found’. A shorter escalator, again in a white tube, turns back to climb towards the public space, called the Plaza at the old warehouse roof level, but curiously ends short of it. Wide brick steps bridge the gap. At the Plaza’s centre is a vast lobby with curving white ceilings and skewed columns. On one side is the hotel lobby. Glass walls curve like curtains on the north and south sides, through which is access to an outside terrace. An arch incised in the glass above marks each passage. Because the new volume above continues the vertical planes of the Kaispeicher below, its overhang covers the terrace, and goes all around the 340m perimeter. The experience out there is breath-taking — not just because of the all-round view across Hamburg, the docks and the dark water far below, but because a feisty wind can blow from the river. Like Herzog & de Meuron’s Tate Modern Switch House viewing gallery, the paving is brick, but its colour is the warm red of the Kaispeicher. ‘We were brutally archaic and simple,’ comments de Meuron. The foyers reach across to the extraordinary 16,000 sq m facade of the new glass volume. 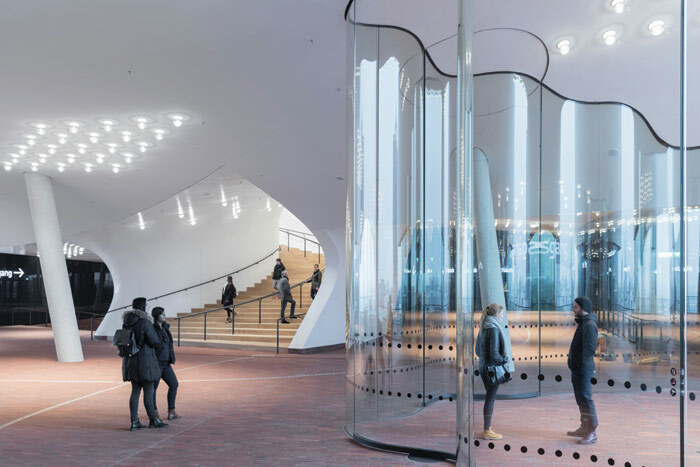 The glass has such heavy chrome-print fritting, it looks as if it’s been splashed with grey water, but it frames ellipses of clear glass that repeat across each floor. Of 2,200 panes, almost 600 curve out spherically like lens surfaces, looking as if melted. Herzog compares them with the windows at Prada Tokyo (2003), which gently push out from a diagonal lattice like a quilt, and even suggests it’s ‘more like Op Art’. Some of the Elphilharmonie’s windows open, and there are six balconies in semi-circular recesses by the concert halls, and many more on the western facade, behind which are 45 apartments. From the outside, the ellipses, balconies and gentle outward bulges make the facades very different from the conventional glass-curtain wall. 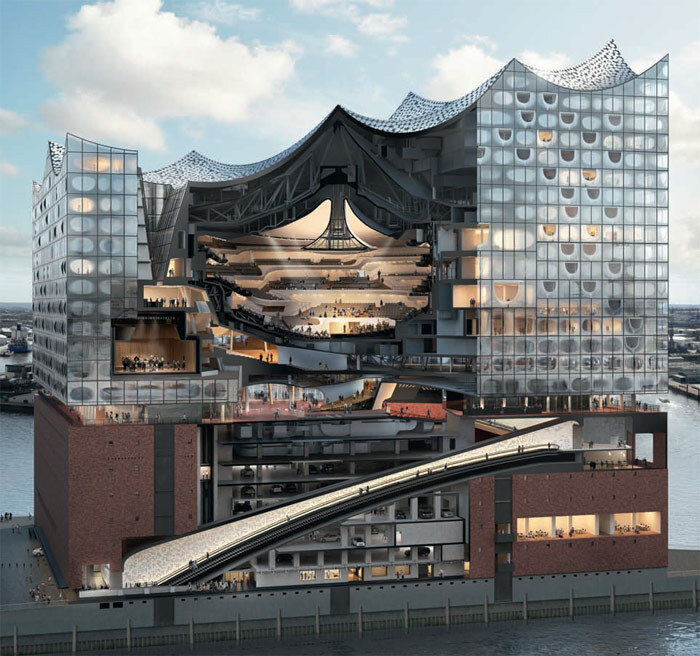 There are three performance spaces in the Elbphilharmonie. The 150-seat Kaistudio, for experimental music, is on level 2 within the Kaispeicher. It’s the heart of an education zone that will also rehouse the Klingende Museum of musical instruments. Two floors above the Plaza is the 550-capacity Small Concert Hall or Recital Hall, for chamber music. 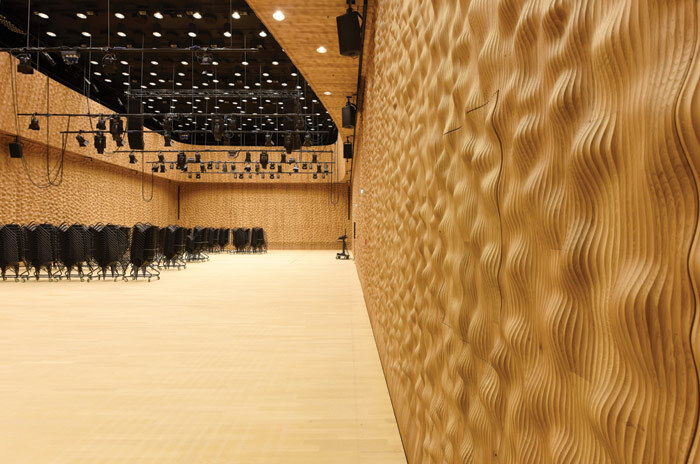 Like the Kaistudio, it is shoebox shape, but it is lined with wooden acoustic walls, which are ridged and curve sensuously. 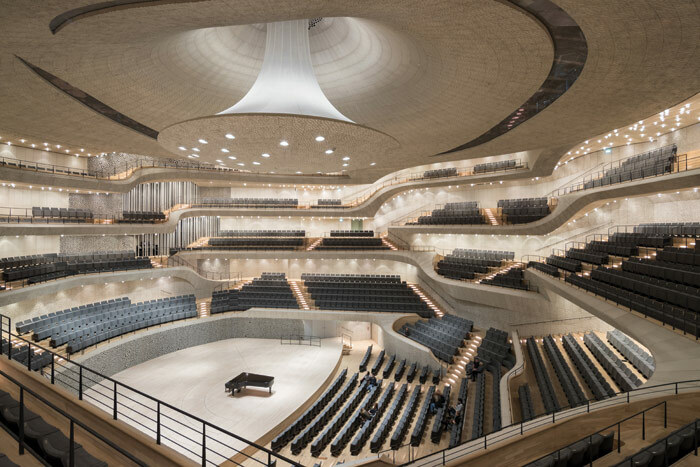 But Elbphilharmonie’s hidden jewel is the main auditorium, the Grand Concert Hall. This is like a vast cavern 25m high and up to twice as wide. It is lifted from the Plaza on columns and insulated from the surrounding structure. Had it not been, de Meuron observes, you would ‘feel the vibrations of the ship horns outside and the big diesel engines. You have to protect the concert hall from the noises, so it’s supported on [structure that acts like] cushions’. The capacity is 2,100, in tier above tier of banked seating in irregular blocks around a shell that widens out with height to level 14 between its irregular hexagon of walls. Herzog comments that ‘we didn’t want to take people on a trip like a spiral, but we wanted movement’. Like Hans Scharoun’s marginally larger Berliner Philharmonie (1963), this hall follows the ‘vineyard’ model of audience distribution, so they face the stage from all around. 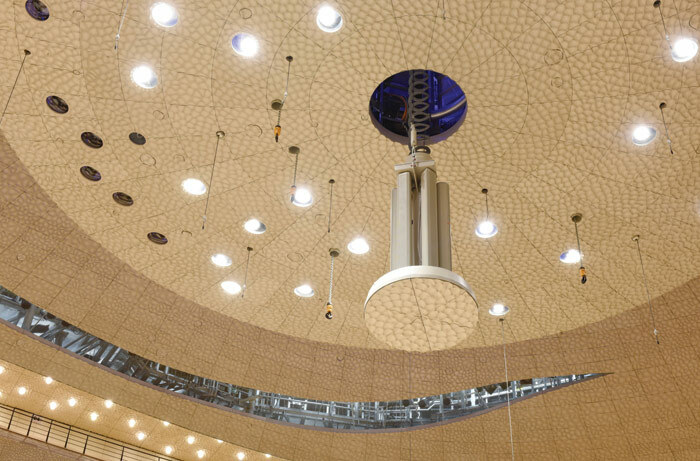 The void is dominated by a two-storey, upside-down, mushroom-shaped sound reflector suspended above it. Herzog compares it to a chandelier. Above it, a clear-glass sliver, behind which is lighting equipment, loops like a trailing ribbon around the ceiling, which in turn curves upwards like an inverted hyperbolic funnel. 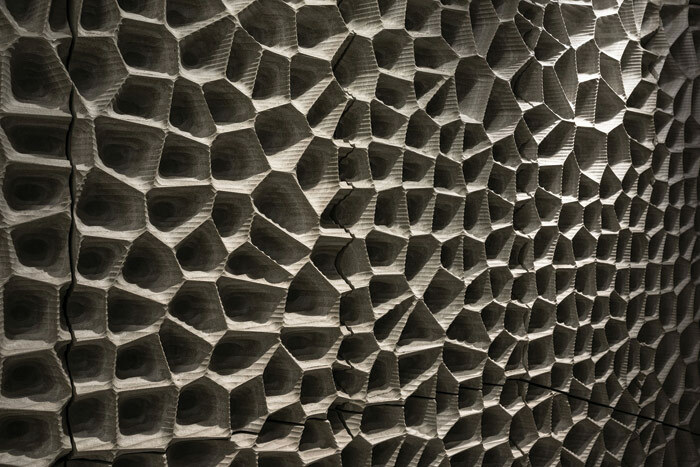 The walls, ceilings and base of the acoustic reflector are lined with ridged gypsum fibreboard, patterned to act as an acoustic baffle with a tessellation of irregular craters. 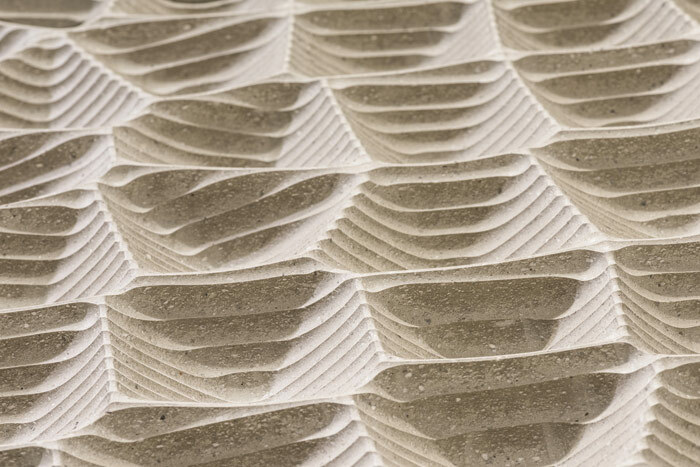 Every one of the 10,000 gypsum panels is different, and they make up a reverse-map of the acoustics at the space boundary. 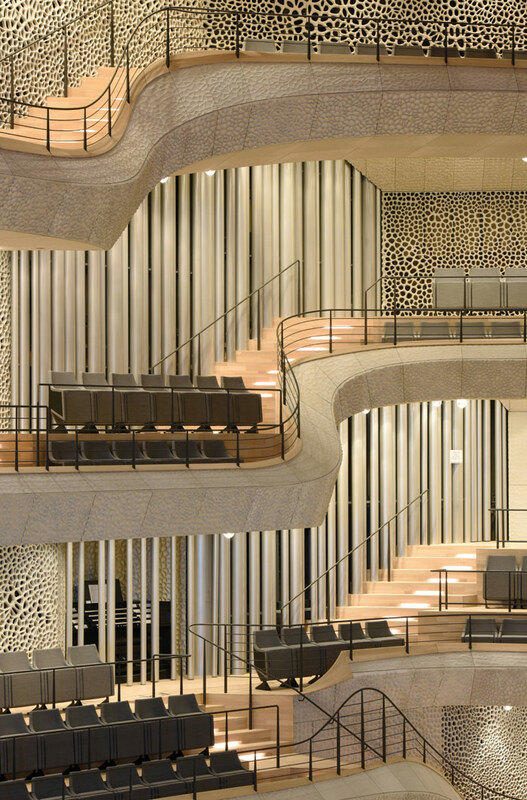 At one part of the wall, some of the 4,765 pipes of the organ, built by Klais of Bonn, break out in a vertical forest, and there are two high windows to the outside world. It is a simply astonishing space, and its surfaces and off-symmetrical configurations give it a distinctly organic feel. Other rooms, too, distil the sense of fantasy pervading the whole building, but in different ways. 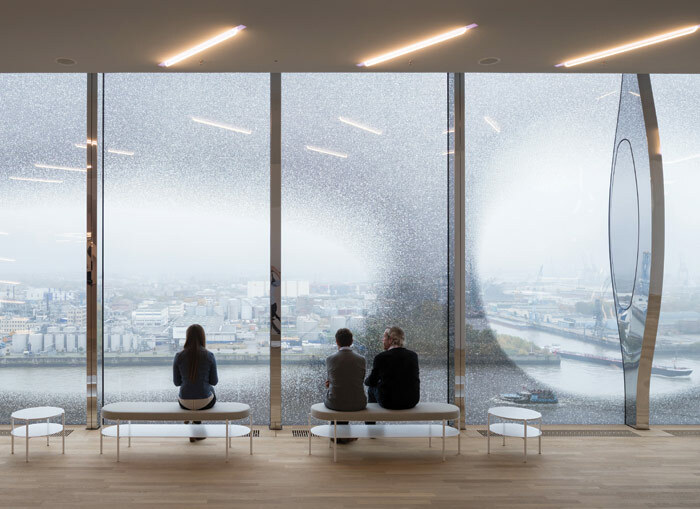 For example, high above the Elbe, on level 20, is the much more intimate Christine and Klaus-Michael Kuhne Skylounge (named after the Elbphilharmonie donors who chipped in €70m). Its ceiling sweeps down from double height to almost touch the floor. It follows the roof above it. The roof itself is the crown. At its edge, there is an echo of the wavy roofline above the entrance of the Berliner Philharmonie, but here, the waves sweep across the building, more like Robert Matthew’s Commonwealth Institute roof. 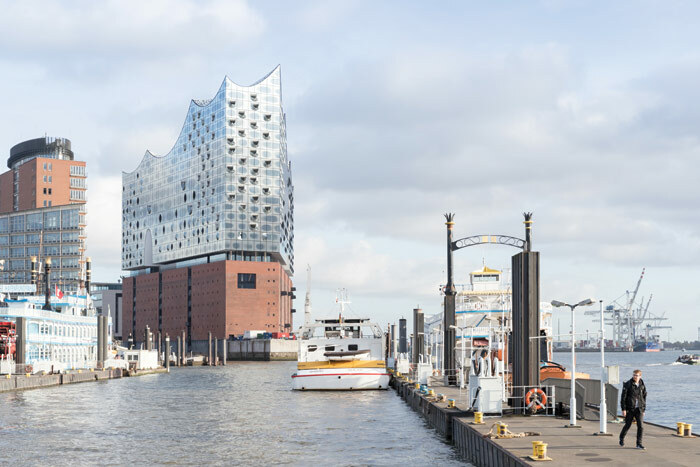 The Elbphilharmonie rises up to 102m at the narrow western end, as if the waves were being squeezed upwards. Herzog explains that ‘the city set the height limit. I know few architects who would not go higher’. Metal disks, some 5.8m-wide and referred to as sequins, cover the surface. A patio is cut into the frozen wild sea of the roof, revealing the Town Hall and spires of Hamburg marking distant land beyond the waves. By coincidence, the Elbphilharmonie is not the only dramatic new volume recently placed on an old docklands building — ZHA’s Port House opened just months before it. That, too, was about local regeneration. 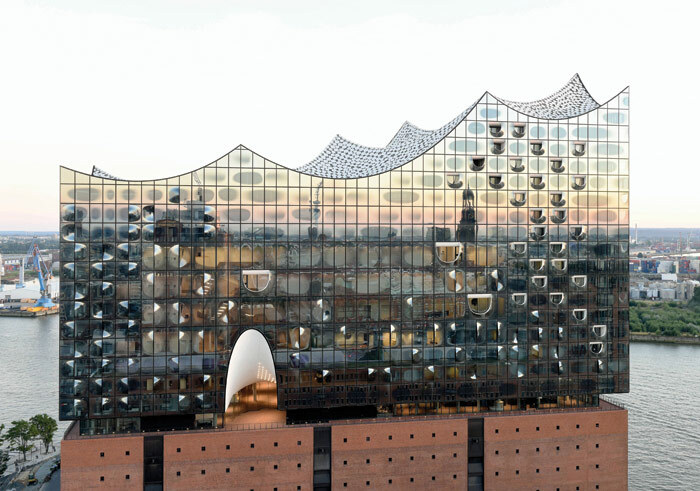 As the base for a philharmonic orchestra, and with its waterside luxury apartments, the Elbphilharmonie could be accused of being a very expensive foible for the metropolitan elite. On the other hand, it reaches out to the whole city, whatever the musical taste. It invites everyone in and offers its Plaza, as big as the Town Hall’s square. They will surely come and come again. They will bring life to the nearby streets of Speicherstadt, which can be a ghost town at night. Hamburg has gained a whimsical but brilliant icon that will change the perception of the city around the world.